You need to make changes to your office and you need to make them fast. That’s usually the position our clients find themselves in when they contact us about our panel extender quick-ship program. The reasons for these quick changes are manifold: company transition, growth or seizing a can’t-miss opportunity to move into a new workspace with basic desks and/or cubicle walls. In many situations, you aren’t as concerned about style as you are about function – the panels need to go up fast and the more neutral the color and form, the better. The scenarios we mentioned here are pretty universal and our quick-ship program reflects that kind of one-size-fits-all situation. Basically, the OBEX quick-ship can be broken down into three different parts: the panels themselves, shipping and warranty. While our normal line-up features dozens of different color and material for cubicle walls, privacy panels, panel extenders and modesty panels, our quick-ship program provides one, simple solution: aluminum-framed translucent polycarbonate panels. We consider this single option a very utilitarian choice – they get the job done without any added frills. But don’t underestimate their design. Design not featuring flashy colors or materials, they manage to stay modern and blend in with just about any office environment. Looks aside, polycarbonate is an effective way to reduce sound, too. The material is used all around the world as a popular sound deadener in offices as well as a barrier between transportation thoroughfares (roads, tracks) and neighborhoods. 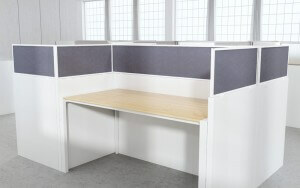 These quick-ship panels come in three different install styles: freestanding, desk and panel. The panels you get from this program cover nearly any desk/cubicle situation. What makes our quick-ship program unique is that your panels will ship within 48 hours of your order and you’ll get a 5% discount on the total order. Our goal isn’t to gouge you because you’re in a jam; it’s to provide a straightforward solution to get you up and running as quickly as possible. Our quick-ship shipping comes with a few things you should know. First, the maximum quantity you can order is 25 units. Second, our quick-ship program requires cash on delivery for the first two orders you make. After that, you can work with OBEX to come up with credit terms to finance future purchases. Because of the nature of our quick-ship program, once an order has been acknowledged and confirmed, it is final. Returns aren’t normally accepted, but if we do agree to it, there are re-stocking charges involved in the return. OBEX’s 10-year warranty also applies to our quick-ship panel extenders and covers our products against defects. Basically, if there’s a defect in your panel extenders that isn’t due to normal wear and tear and you’re the original owner of the extenders then you can file a claim with us. We’ll inspect the panels to verify that the product is defective and will decide if we’ll repair it or replace it. Aside from normal wear-and-tear situations, other situations that wouldn’t be covered under our warranty would be those random situations in which, say, somebody at the holiday party gets too friendly with the open bar and then accidentally kicks a hole in a modesty panel. This post has focused on our quick-ship program but OBEX certainly provides more than quick fixes for your company. If you’ve got more time to make a decision about your privacy solutions, consider taking a look at our acoustical panels. They are, in our opinion, the superior choice for maximizing sound privacy in the workplace. You see, a panel’s ability to deaden sound is based on two popular ratings: noise reduction coefficient (NRC) and sound transmission class. Our panels reduce sound by more than 50%. In addition to their ability to deaden sound and provide a more tranquil workspace, OBEX panels are easy to install. In most situations, one individual can put a panel on a desk in less than five minutes. All hardware and the necessary Allen wrench is provided in the panel kits we send you. Our panel extender installation guide gives you an excellent idea of what the install process is like. If you have questions, we’re happy to answer them. Give us a call at (888)571-8658 or contact us through our website.